Norwegian marine display manufacturer expands US market activity. During SMM 2006, Jakob Hatteland Display (JHD), the world leading manufacturer of marine displays and panel computers signed a distribution agreement, appointing Radio Holland USA as the distributor of the Series 2 range of marine displays in the USA and Caribbean. This contract is one of many existing agreements including servicing and sales between the two companies. Radio Holland USA will work alongside the existing Hatteland office in Orlando, to introduce the Series 2 at the forthcoming Ft. Lauderdale International Boat Show, 26th - 30th October 2006. 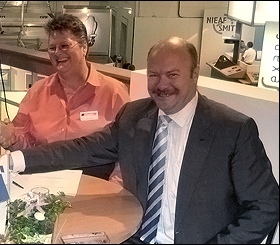 Back left to right: Lars Eriksen, Managing Director, JHD; Kim Scott, Materials Manager, Radio Holland USA. Radio Holland USA is firmly established in the US market as a supplier of electronic systems to the commercial and leisure markets. 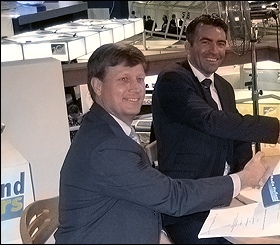 The Radio Holland Group is one of two worldwide service partners for JHD and the companies already enjoy a strong working relationship, which makes the ideal platform for the Series 2 distribution agreement in the USA. "Series 2 is the next generation of marine display systems and we see huge potential for it in our markets," comments Jack Haynie, President, Radio Holland USA. "As a JHD service partner we already have a great understanding of the company's products and business network. We are in a great position to distribute Series 2 to the American and Caribbean market, and are looking forward to presenting it on our stand at Fort Lauderdale." The Series 2 is the world's first marine display system to offer the choice of delivery as a monitor only or a monitor combined with a computer. The modular backpack, which docks into the rear of the screen can be either an interface unit or interface and marine computer. Both modules are the same dimensions for easy future upgrades and straightforward servicing. With multiple inputs, capable of displaying everything from chartplotter and echosounder to full NMEA and CCTV, Series 2 users will benefit from the ultimate in flexibility. The clean, striking and modern design of Series 2 alludes to the high-technology inside the slim aluminium casing and makes the system the ideal choice for the style conscious leisure boater, skipper or superyacht owner. Hatteland Display has developed a unique new Optical Technology, which ensures the sharpest picture in all conditions and the elimination of misting. With high light intensity and contrast, combined with 0-100% backlight, the Series 2 provides unmatched sun and night vision. "Series 2 has been received extremely well in Europe and we are expecting it to be just as popular in the US market," comments Øystein Bredal-Thorsen, Sales Manager, Yachting, JHD. "The coming months will see extensive activity as alongside Radio Holland USA, we present our sophisticated new monitors to one of our most significant markets. To help facilitate a successful launch in the USA we are investing in our own existing American organisation through staff placement from our head office in Norway." Hatteland Display manufactures high quality marine monitors and computers. It is part of the Hatteland Group, which was founded by Jakob Hatteland in 1971. Based in Nedre Vats, Close to Haugesund on the West coast of Norway, the Hatteland Group has offices in various European countries and a worldwide service network. Its products are used by system integrators and can be found on all vessel types, all over the world. The company prides itself on quality, and boasts multiple Type Approvals across al of its products. Radio Holland USA is a division of the Radio Holland Group headquartered in Rotterdam, the Netherlands, and has a trained, professional global sales and service team available 24/7. They offer customized and turnkey solutions that include Consulting and Engineering, Installation and Sales, Shore based maintenance with full reporting capabilities, Commercial Airtime and Training. Radio Holland warehouses one of the largest inventories of marine electronics spare parts for a variety of manufacturers. Its qualified technicians can supply, integrate and install commercial marine electronic equipment for various maritime users in Deep Sea Shipping, Energy Offshore, Fisheries, Cruise and Passenger Liners, Inland/Workboat, Government Survey, Dredging and Yachting.